Officers are appealing for witnesses to the incident which happened around 3.10am on Friday, February 22 outside an address in Cheviot Place. A member of the public noticed that the rear garden area of one of the properties was alight and contacted emergency services. The Scottish Fire and Rescue Service attended and extinguished the flames, which caused minor damage to the building’s guttering. No one was injured and inquiries but police believe the fire could have turned more serious very quickly. Investigations to identify those responsible are ongoing. Inspector Jim Morrison said: “Thankfully the flames didn’t take hold of the building or the consequences could have been far more serious. “We are working alongside the fire service to establish the exact cause of the fire but would urge anyone who remembers seeing any suspicious activity around Cheviot Place in the early hours of Friday morning to contact police immediately. 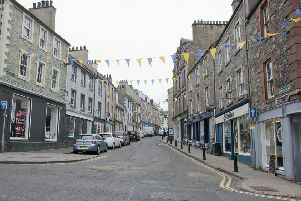 Those with information can contact Hawick Police Station via 101 and quote incident number 404 of the 22nd February. Alternatively an anonymous report can be made to the charity Crimestoppers on 0800 555 111.